This debut collection appears after a long gestation. Oliver Comins has had four pamphlets published: Playing out Time in an Awkward Light (Mandeville Press, 1992), followed by a lengthy gap until a burst of three titles, all from Templar Poetry, in 2014, 2015 and 2016. Less than a handful of those poems are repeated here. 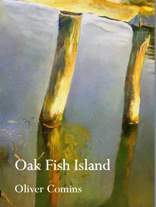 Oak Fish Island contains an explanatory note about its internal timescale and structure, suggesting that Comins has re-visited his early work and then allowed his more recent poetry to rise from those foundations. The collection is divided into two roughly equal halves with, as Comins tells us at the start of the Acknowledgements, the poems in Section One written during the late twentieth century, and Section Two being post-2000 poems. With some poets this might have been immediately obvious: there would have been noticeable changes in, for example, style, content, political or social reference. I’m sure you will be able to supply any number of examples of your own. Yet in Comins’ poetry I could see no major differences in style either side of the millennium. If he hadn’t pointed out how he had structured Oak Fish Island I wouldn’t have noticed. After several readings, with a corner of my mind trying to identify changes, all I could see was continuum – a poet who is a consistently quiet, thoughtful observer of people and places, often something of an outsider, and one whose chosen style is free verse. To borrow a line from Auden, the line he travels has the English gauge. Dens: they were the stuff of childhood, our parallel to the grown-up world. Another childhood poem, this time from Section 2, provides the collection’s title, a strongly-drawn memory of two boys fishing for sticklebacks and minnows, although here Comins brings in his adult self in the final stanzas, observing how much of the place has vanished, and how ‘… there’s nowhere at the bottom to hang out / for hours, no island in the middle of summer.’ His childhood friend has disappeared, too, making real the way the two boys parted after a day’s fishing when ‘… we made a sloped return to our separate homes, / wet footprints parting where the tarmac forked.’ Perhaps this bleaker perspective is an element in the twenty-first century poems, with Comins starting as a participant and then shifting into being the observer watching his own past fall away. However, the carefully pared-back language, matching the precision of detail and balanced with clarity of syntax is a constant in both sections – and a delight to read. the fields full of barrows full of bombs. but we are joined to one another by breathing the same air. three of us beginning our days with solace of a kind. for her to find an almost perfect line. Comins is poet who invites longer quotation; his meditative observation deserves this, so I’d like to end with quoting in full ‘Swan Song i.m. Ursula Wadey’. A note explains that she was a mature student (fifty years older than her fellow undergraduates) when Comins studied at York. The visual detail builds up the texture of her fully-realised life while the poet stands back, letting her be centre-stage. head high, eyes open, saying what was there. There is a sense throughout this whole collection that Comins, too, is writing about what matters and what will survive. The long gestation of this collection has given him time to consider what is best in his work; a quiet register, his care that human connections should be maintained, even as technology can sometimes distance us. It is a bonus that Templar have produced a physically attractive book which is a pleasure to handle. In every way it was hard to set this collection aside.